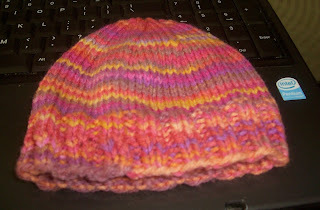 I recently finished 2 hats to add to my box of things for the Charity. I am currently working on a baby hat at the moment. I want to get a couple of scarves cranked out also. The socks were originally meant for my niece but they are made from Superwash wool & my sister is severely allergic to wool & I don't want to take the chance of her breaking out (as I have been told some people can do who are allergic to wool) so I figured next best idea send them out in the box to warm up some little kids feet.